Think about every holiday gift you've received in the past five years. Now, ask yourself: would you have Yankee Swapped the jingle bells out of all of them for a box full of alcohol that would appear every month in your mailbox, via the very real magic of the US Postal Service? If you answered "yes," congratulations! You sound fun at parties. Also, you've stumbled upon a master list of the best beer, wine, booze, and booze-related mail-order subscription services available. 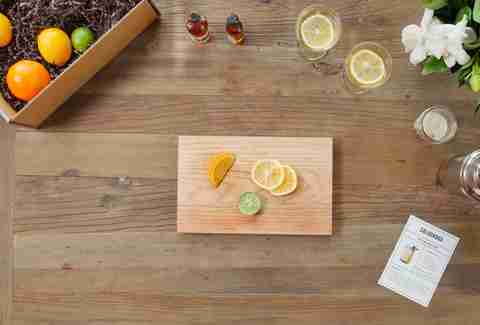 (Also check out our bigger list of recommended food-and-drink subscription boxes.) From monthly craft brews sourced from sea to shining sea to real-deal T-shirts from dive bars all over the world, this is the ideal list for every drinker that managed to dodge the naughty list this year. What you get: Basically, it's exactly what you think it is. Once a month, the Beer of the Month club will send you a curated selection of craft-brewed regional beer, alongside a newsletter about (you guessed it!) the beer community, with tasting notes on each month's selection. There are several different package options available, featuring domestic beers, international beers, or both. And they don't slouch on the selection, you'll be getting brews like Portland, Oregon's legendarily weird Hair of the Dog or Atlanta fave Sweetwater Brewing Company's 420 Extra Pale Ale. You can also get a package that includes six bombers, or beers that pair well with cigars. Basically, you never need to leave your home again… well, at least for one weekend a month. This just may be the gold standard mail order beer subscriptions. Best for: Those who want hard cider... but not the kind you'd find in a bodega (not that there's anything wrong with that). 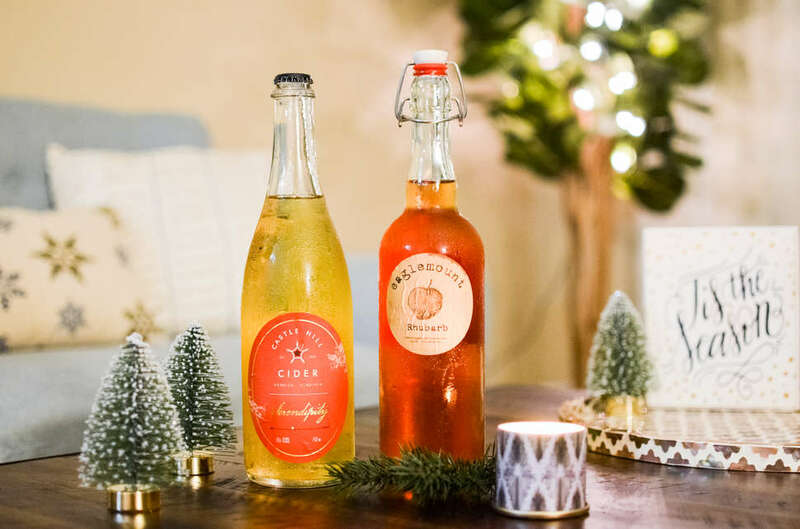 What you get: Every month, Double Cider will ship two bottles (ohhh now I get the name) of "some of the rarest and highly sought after" cider in the US. Just to be clear, they aren't shipping you six-packs they sell in the gas station (again, not that there's anything wrong with that) -- these are big bottles of small-batch, high-quality ciders. This month they feature a rhubarb-accented (fancy!) selection from Eaglemont Cider, out of Port Townsend, Washington, and a Serendipity Cider -- made from Ablemar Pippin apples -- from Virginia's Castle Hill Cider. This is the only option on this list you can viably drink with your pinky up. What you get: Taster's Club's spiel is basic enough: Every month, you get a bottle of whiskey, scotch, or bourbon from a renowned distillery. You'll commonly see blends along the lines of like Hudson Valley's Hillrock Solera Aged bourbon or Scotland's own Glenrothes 1985 Scotch along with an accompanying tasting guide to help you imbibe knowledge along with sweet, sweet liquor. This is one of the better ways to try new and rare whiskeys while immersing yourself in the oft-confusing world of new and rare whiskeys -- all without breaking your drinkin' budget completely. How much is it? : Whiskey and bourbon packages start at $69 per month, while Scotch starts at $79. Classy. What you get: If your taste in brew skews towards the EU, you might want to opt for Belgi-Beer over any other Beer of the Month club, as the subscription service specializes in beers imported from Belgium... obviously. Not only does Belgi-Beer provide you with a new beer selection every month, they also include that brewery's specific story, and swag including the proper glassware from the brewery itself, which is essential to the Belgian/beer nerd experience. There's no better way to experience a country's culture than through booze -- so consider this your passport to the wonders of Belgium. "Peeing Boy" statue not included. Probably? What you get: Saloon Box delivers the liquor and fixins to make two glasses of an elaborate cocktail, on either an a la carte or month-by-month basis. So you’re only getting two tiny, airplane-sized bottles of liquor, but, you’re often getting small-batch spirits that don’t usually come in sample sizes at all. You’ll also be sent bitters, syrups, tinctures, and all the other fancy accoutrements usually reserved for bartenders wearing suspenders. For example: a winter-themed Flying Scotsman, complete with Glenrothes Vintage Reserve Scotch Whisky, brown sugar syrup, Scrappy’s Orleans Bitters, and a little vial of grapefruit juice. If you just want a low-stakes experiment with complex cocktails, Saloon Box should be your jam. What you get: The OG Craft Beer Club works similarly to the other craft beer experience on the list: each package is stocked with 12 beers overall, with four different styles from two different breweries, along with a newsletter and tasting notes. You'll be getting rotating selections from American breweries like New Mexico's Sante Fe Brewing Company, Devil's Backbone, from Roseland, Virginia, and Brooklyn's Sixpoint, -- in literally every style of brew you can imagine. But, for those who only wish to imbibe periodically, you can opt into an "every other month" or even a quarterly package. Not sure why you wouldn't want more beer -- but to each their own. What you get: Founded by two MIT dorks with a passion for drinking vino, Bright Cellars uses a personalized questionnaire to pair individuals with curated blends from wineries all over the world. You'll take a quiz (don't worry, it's fun), rate what they send you, and eventually get four bottles per month, customized to your predetermined taste. It's almost 2017, after all: you should surrender all your free will, including alcohol preferences, to the unrelenting harness of technology. It'll be like Black Mirror, with way more giggling and sassy gossip sessions. What you get: Every quarter, Flaviar will send you a sampling of three different rare and premium booze samples (of almost every variety) in 1.5-ounce test tubes. Which really makes a fun enough time its own. But Flaviar's true purpose (and ultimate value) is to expose customers to liquors and brands they actually like, so every sampled liquor is available in the full-sized variety for a discounted price. That way you can have a liquor cabinet full of stuff you actually want to drink. And, despite what Mr. Rogers may have told you, it's OK not share sometimes. Best for: Honestly, anyone who drinks beverages of any kind. So, everyone. 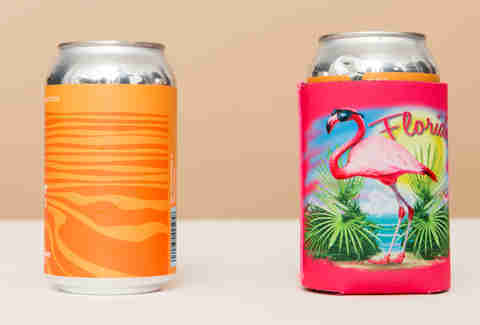 What you get: One brand new, almost always cheeky can koozie every single month. And the lineup is seriously varied -- sometimes you'll get koozies from real life bars/restaurants across the country, and occasionally you'll even get can cooling swag that references pop culture touchstones like the Halloween series or The Simpsons. It's a true crapshoot. But hey, so is life. That's why we have beer in the first place, right? What you get: If you don't like so-called "fancy beer," but still want to get something in the mail every month that publicly screams "I love drinking!" (and who the heck wouldn't? ), you can opt into the Dive Bar shirt club for some good old fashioned sartorial fun. The premise here is super simple: they'll send you a real t-shirt from a new (definitely not fake!) dive bar every month. These shirts come from actual dive bars, too -- like the tiki-themed Bikini Lounge in Phoenix, or the legendary Harry's Banana Farm in Lake Worth, Florida. The only downside is potentially running into someone who has actually been to one of these places and having to explain you just got the shirt in the mail. Hey, it's better than no shirt... right? Wil Fulton is a staff writer for Thrillist. He makes his own koozies from tree bark. Follow him @wilfulton.